I've been and gone and come home again. I left last Wednesday for the Pacific Northwest, flying from Memphis to Chicago and then Chicago to Seattle, then taking the train from Seattle to Portland. It was a long day and by the end of it I was smelly and sweaty and hated almost everyone. Flying is not my favorite activity, especially the 3 hour + flight to Seattle. But once we flew into view of Mount Rainier and Mount Baker I was a little less nervous. The mountains are breathtaking, I can't imagine I'd ever get tired of looking at them. Once I landed in Seattle I took the bus to the Amtrak station to wait for the train to Portland. The station seems to be mostly original but based on what I saw they're doing some construction and repairs. The inside has beautiful old moldings and fixtures. The train trip itself was excellent, if all trains were like the Amtrak Cascades I'd never travel any other way. I didn't get a window seat but I was able to get a decent view of the landscape. Again, more breathtaking views of the water and the mountains. Loved it. Once in Portland, my friends Lynsey and Ted picked graciously picked me up and took me to dinner at Apizza Scholls. There was olives and pizza and hard cider. Later, Lynsey and I went to Powell's Books and I almost fell into a book coma. Holy hell, the books. Completely amazing, sadly by the time we were at Powell's I had been awake since 6:30AM Tuesday with about a 3 hour nap and I didn't remember to take any pictures. I bought some Ralph Waldo Emerson and George Eliot for the library and bought Doug a children's insect book and the new Bukowski book. Thursday morning Ted and Lynsey picked me up at my hotel, the Jupiter and we went for waffle sandwiches at Flavour Spot. As if I needed another reason fall madly in love with Portland, oooooh the waffles. We shared one with Nutella and raspberry, one with sausage and whipped maple butter and one with ham and some sort of cheese that I can't remember right now. Words cannot describe how awesome these were. I have dreams about them now. They drove me around some Portland neighborhoods and the Pearl District. There was a visit to Knit/Purl for yarn and Josephine's Dry Goods for fabric and notions. I restrained myself and only bought *three* skeins of yarn. A mid-afternoon snack at Por Que No Taqueria on Mississippi and I had quesadillas with squash blossoms and a blueberry margarita, which was pretty and delicious. Doug had requested 'fancy' salt so I found The Meadow, also on Mississippi, and bought him a starter set. I've never seen so many kind of salt and pepper in all of my life. They even had salt bricks. I won't bore you with the other details but I had a fabulous day with friends in Portland. By the end of the day I had also been to Petite Provence, (one of these is called a 'Monkey Bomb' and it had a coconut macaroon base, banana custard, banana slices and a chocolate shell), Random Order Coffeehouse, the Grilled Cheese Grill (bus), walked around the Alberta neighborhood of Portland (everyone has these amazing gardens), seen some people playing unicycle polo and had a late night snack of Belgian frites with rosemary-truffle oil ketchup at Potato Champion. Friday I was on my own, I didn't rent a car because everyone told me the PDX public transit system was excellent. It was, before I left Memphis I downloaded the PDX bus app for my iPhone and it was spot-on. All I had to do was type in the address I was at and the address of where I wanted to go and it gave me perfect directions. However, if you get distracted and don't pay attention to what direction you're going you may end up in the Portland 'burbs instead of downtown. Everything was a little more low-key on Friday, I wandered around and took in the scenery. I found out that The Thermals were playing for free at a record store a short bus ride away from my hotel so I went. The band was good but the store was packed with sweaty people and after six songs I had to leave because it was so hot and I was hungry. I ate dinner at this place, I just happened to stumble upon after I left the record store. Wine and a prosciutto and apple panini for dinner. For some reason I ate a lot of pressed sandwiches while in Portland, they were all good though. Sorry I was MIA last week, I was getting ready to go out of town and got too busy to bake/make. But I did make the vanilla ice cream at the beginning of the month, in fact it was so good I made it twice in July. Considering the 'eggy' flavor of the honey-peach ice cream I was a concerned the vanilla ice cream might have the same issue since it's also made with egg yolks. But I had no need to be concerned. I used a vanilla bean and let it steep in the cream/milk mixture for 45 minutes. The ice cream was beyond delicious, it oozed vanilla flavor and didn't taste eggy at all. Great selection from Lynne of Cafe LynnyLu, thanks! Spent 80% of the weekend knitting in an attempt to finish up my Ophelia cardigan. Casting off today, seaming & blocking tonight and maybe, just maybe, I can wear it tomorrow night. Drank grape soda in a glass bottle. Had forgotten how good grape soda in a glass bottle is. Cooked some tasty things, including Shrimp and Grits (used Bobby Flay's recipe), Cherry-Almond Cake (from Martha) and threw together a mozzarella, tomato & basil pizza. And we are more purple pole beans from the garden. Yum. It was bizarro world in Memphis the last few days. The humidity was practically non-existent and the weather was so gorgeous and the highs were in the 80's, almost unheard of in the middle of July. I tried to spent as much time as possible in my red wicker chair outside. Mosquitoes were unfazed though and still found time to munch on me. So what's a girl to do when her husband is off playing D&D? Make chocolate sorbet, that's what. Last night I was home alone (which I enjoyed) and I wanted to make something sweet but it was nine-million degrees outside and turning on the oven was the last thing I wanted to do. So I pulled out the ice cream maker and poked around online. Smitten Kitchen had a posting from exactly one year ago yesterday for Chocolate Sorbet from David Lebovitz's The Perfect Scoop. I happened to have all the necessary ingredients on hand so I got to making sorbet. I used up the last of the Hershey's Special Dark cocoa powder for this so it was extra dark and chocolaty. I licked the spoon and the bowl and the ice cream paddle and the bowl again - you get the picture. Even in non-frozen form it was damn good. It also took *maybe* 15 minutes to put together (not including the time for cooling the mixture, running the machine & freezing). It was even better when we dug into it tonight. Delicious. It melts quickly though but if you eat it as fast as I did that won't be a problem. And in further poking around online today I found Cake Wrecks. I'm probably the last person in the universe to see this but I have been reading it all afternoon and my ribs hurt from laughing so hard. Bell peppers are starting to ripen too Everything else is growing no really significant changes just bigger and/or bushier. 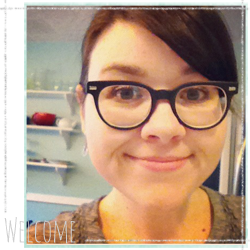 This week's selection was chosen by Denise of Chez Us. I really adore yeasty breads and rolls and cakes. And I was excited to get to make the Brioche Plum Tart because the last time I made brioche dough I did not have my Kitchen Aid mixer and I had to make it by hand. 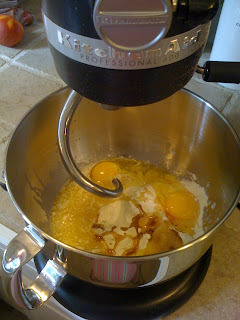 It was worth it but I knew it would be so much easier with a stand mixer. 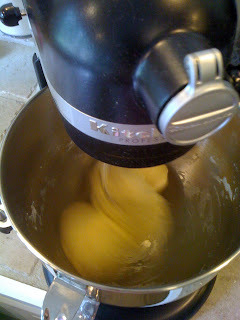 Putting the dough together was super simple, the rising wasn't difficult, I just had to make sure I was staying put for 2+ hours. Generally speaking the recipe wasn't hard it just took a lot of time but not actual doing stuff time just waiting time. I left the dough in the fridge overnight and then put the tart together the next day. 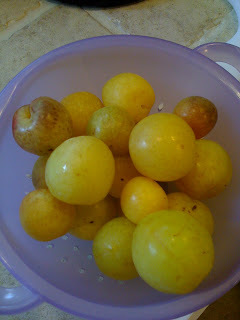 I used little Byron Gold plums from Jones Orchard I bought at the Memphis Farmer's Market. I also bought a jar of plum jelly from them to use in the tart. For the topping instead of walnuts/almonds I used pecans because I have an abundance of them in the pantry for some reason. The tart was good but even with the foil tent my crust got really brown really quick. And the plums were a little tart for my taste. I like the tart recipe a lot and I think I'll make it again later this week but use apricots or peaches instead of plums and hopefully I'll get a better result. By 10AM this morning I was ready to throw in the towel for the whole week. I woke up not feeling well anyway and then I get to work and was bombarded with snarky emails and cranky phone calls. At noon I put out all the immediate fires, sent my boss an email saying I was heading home, packed up my laptop and went on my merry way. Several things made me feel better. A nap with one of my cats, Maggie, she's the best couch-napping cat there is. The realization that I leave for Portland in nine days. The last of my homemade vanilla bean ice cream. And some new books. Hope your Monday was miles better than mine! Oh brownies, how I love thee. This week's selection comes from Lisa of Surviving Oz, she's not a TWD baker but she did design our new TWD logo so she got to pick a selection. I'm so glad she did because these brownies are phenomenal. The story as Dorie tells it is that Ms. Hepburn once said you shouldn't put too much flour in your brownies, thus this recipe was inspired by her. They are so good, fudgy with melty chocolate and a hint of cinnamon. Mine look super dark because I picked up some Hershey's Special Dark Cocoa recently and it made my brownies almost black but the taste doesn't seem very different. I've used it for World Peace Cookies too and they still taste great. I used pecans too and they were a nice crunchy contrast to the melty bits of bittersweet chocolate. Also the recipe called for instant coffee but I used instant espresso instead. Yum! The brownies did not last long at all because they were so good. Thanks again Lisa! Happy belated Fourth, we kept it low-key. We had family over on Saturday afternoon and ate outside in the shade, trying to enjoy the fact it wasn't a thousand degrees. I made the usual suspects plus a tomato + basil + mozzarella salad with tomatoes from Whitton Farms, pearl-sized fresh mozzarella and basil from my garden. 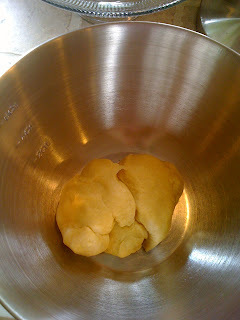 Plus a little fleur-de-sel, pepper and olive oil to taste. Super simple and the leftovers are especially good over pasta. I also made this week's TWD selection (OMG brownies!) and the selection for the last week of July, vanilla bean ice cream (OMG ice cream!). It was all really, really good. We had planned on going to see fireworks downtown with friends but by the time everyone left our house we were exhausted and opted to stay home and watch 48 Hours re-runs. Yes, we are that much fun. Sunday I knit, took a trip with friends to Joann's for fabric and notions and made a fig tart. My friend Melissa inspired me to make a fig tart when she made one recently. I used puff pastry from the freezer, sliced figs from my trees, Peace Bee local honey and some goat cheese. It was d-e-l-i-c-i-o-u-s. I am somewhat ashamed to say I ate the entire thing (not in one day though) but it was easy since I didn't have to share. Doug is not interested in fresh figs, he thinks figs should taste like Fig Newtons *eyeroll*. I harvested my first cucumber from the garden and some Serrano peppers. 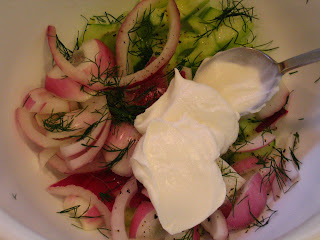 With the cucumber I made a salad of cucumber + red onion + fresh dill + sour cream and salt and pepper. The garden is loving the heat, everything is growing at an amazing rate. Finally some little eggplants, one is a smaller Japanese variety and other is a variety called Black Beauty. Little tomatoes aren't so little any more, these are Green Zebra Stripe. I also have a few Roma babies and all the others have a ton of little yellow blooms. I have a couple of nice sized young cucumbers but I think I've been attacked by cucumber beetles so I need to focus on some pest control. Jack-o-lanterns are going to have to be transplanted but I don't think there is enough room with the beans in this bed. Also my figs are ripe, I've been sharing them with friends and eating them myself because Doug doesn't like them. Last week I had them stuffed with goat cheese, wrapped in procuitto and drizzled with local honey, fantastic.